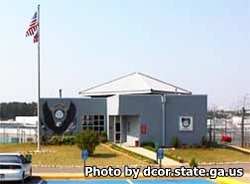 Hancock State Prison is located in Sparta Georgia. It is a closed custody facility that can incarcerate 1,191 adult males. Inmates at this prison have committed serious felony crimes. Offenders are housed in either dormitories, tent housing, or the annex. One of the most distinct things about this institution is the vegan diet it offers to inmates. Inmates housed here may be selected to participate in work details that offer supervised support services to city and county agencies. Vocational skills that are taught at this prison include firefighting, laundry, landscaping, clerical work, barbering, culinary services, and custodial maintenance. Religious services are offered through the Chaplains office and include prayer and religious studies. While incarcerated, inmates are encouraged to earn a GED, adult basic education and learn to read through the educational courses offered. Visiting hours for general population inmates is on Saturdays and Sundays from 9am-3pm. Visiting hours for Tier I and Tier II inmates is on Tuesdays and Thursdays from 9am-3pm.